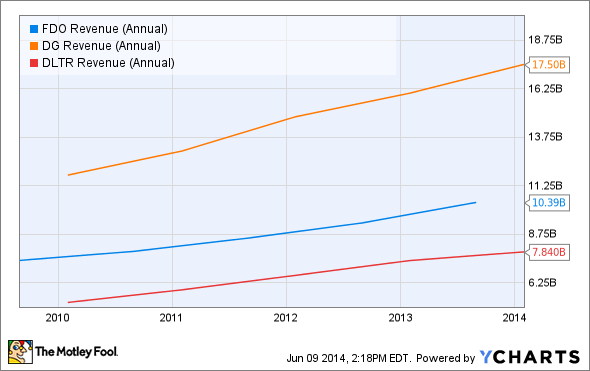 What Does Carl Icahn's Stake Mean for Family Dollar? After news broke that Carl Icahn purchased 9.4% of Family Dollar, shares of the retailer soared. Is this a sign of better times to come, or is the company's adoption of its poison pill an indication that it will continue to lag Dollar General and Dollar Tree? After the market opened on Jun. 9, shares of Family Dollar (UNKNOWN:FDO.DL) skyrocketed 13% on news that Carl Icahn, the billionaire corporate activist, had taken a stake in the company. While this represents a nice return for the company's shareholders, the business is still trading 9% below its 52-week high as its operating performance has left its investors feeling dejected. Does this investment by Icahn signal the start of a turnaround for the discount chain, or would now be the time to sell out and opt instead for an investment in Dollar General (NYSE:DG) or Dollar Tree (NASDAQ:DLTR)? Family Dollar has been doing good... but not great! Over the past five years, Family Dollar has been a strong business, but not anywhere near as strong as its peers. Between 2009 and 2013, the retailer saw its revenue climb 40% from $7.4 billion to $10.4 billion. According to its most recent annual report, the company's jump in revenue came from a 24% increase in aggregate comparable-store sales as well as a 19% jump in store count from 6,655 locations to 7,916. While this performance is unquestionably good, rival Dollar General's rising sales have been even better. During this five-year period, Dollar General saw its revenue shoot up 48% from $11.8 billion to $17.5 billion. Like Family Dollar, Dollar General saw a nice uptick in aggregate comparable-store sales (32%), but it also posted a strong 26% increase in store count from 8,828 locations in 2009 to 11,132 by the end of its 2013 fiscal year. FDO Revenue (Annual) data by YCharts. The best performer in recent years, however, has been none other than Dollar Tree. Over this five-year time frame, the discount chain saw its revenue soar 50% from $5.2 billion to $7.8 billion. According to the company's financial statements, this jump in sales can be chalked up to a 28% increase in aggregate comparable-store sales, combined with a 31% improvement in store count from 3,806 locations to 4,992. In an effort to improve the company's operations, Icahn has taken it upon himself to create a presence within Family Dollar. By acquiring a 9.4% stake in the firm for $265.8 million, Icahn will do what he believes is necessary to help increase shareholder value. Typically speaking, this entails gaining a seat on his target company's board of directors and either pushing for a corporate overhaul and/or a sale of some or all of the assets associated with the business. However, there will likely be some pushback from the discount chain if his proposals are deemed to be too radical. Currently, the second-largest shareholder in Family Dollar happens to be Howard Levine, the son of the company's founder. With an 8.4% stake in the business, it will be difficult to receive approval for any major changes without Levine's consent, but not necessarily impossible. Besides Levine and Icahn, the largest shareholder in Family Dollar is Nelson Peltz-owned Trian Fund Management LP, which owns about 7.4% of the company's outstanding shares. Back in 2011, Trian attempted to buy the retailer with the hopes of implementing changes that would increase its margins, but Family Dollar rejected a bid of up to $60 per share and put a poison pill into place so the prospective acquirer could not increase its stake further. To settle the issue in a civil manner, Trian signed a two-year agreement barring it from making another bid for the business but received, in exchange, a seat on the board where Edward Garden, Trian's CIO, now sits. Since the expiration of the standstill agreement in 2013, and in light of Icahn's investment in the firm, it is possible the two combined could push through changes even without Levine's support. Family Dollar's not afraid to play with poison! In an effort to defend itself from Icahn accumulating any additional shares of the company, Family Dollar's board adopted a shareholder rights plan (aka, a poison pill) on Jun. 9. According to the announcement, the company's plan, which has a duration of one year, will punish any shareholder who increases his/her ownership of the company over 10%. If this 10% threshold is passed, the company's board can authorize the business to hand more shares to each of its investors (in proportion to their existing ownership), with the exception of the party whose stake triggered the event. While this wouldn't necessarily make a takeover impossible, it could significantly dilute Icahn if he exceeds this level, thereby reducing his ownership in the retailer meaningfully. Moving forward, it will be interesting to see what transpires with Family Dollar and Icahn. In recent years, the company has done well for itself but has not been able to keep up with its rivals. It is likely with this in mind that Icahn has invested in the business -- so that he can force changes on the company's board. Given the adoption of its poison pill, it appears management won't be very receptive to what Icahn has to offer, but if the parties can find common ground and work together, then it's possible investors could see some nice upside ahead.